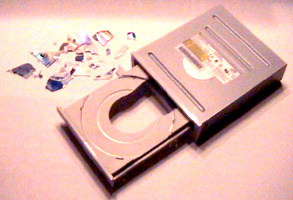 Newegg handles the case of an exploded CD. When you’re in any line of work, you’re bound to come across any number or interesting things that happen on the job. A few weeks ago, I had a client who’s CD-ROM drive died after a few years worth of steady (almost daily) use. So, he decided to take the opportunity to upgrade to a CD burner. I ordered him a Lite-On CD-RW SOHR-5239S for $25 off of Newegg, including shipping. Quite a deal considering the first burner I purchased was roughly $100 a few years ago. Not to mention that the burner was only 8x write. The Lite-On was 52x. That inverse relationship between price and performance over time certainly makes you want to kick yourself later for ever paying so much for the product originally when it’s dirt cheap now. Anyway, I digress from this interesting epic tale that was on the verge of being told. The burner arrived, I installed it in his computer, and he went home a happy camper. He’s a big fan of baseball, and when he isn’t actually watching or playing a baseball game, he’s usually on his computer playing one of the EA Games baseball Triple Play games. It’s an older game that he’s been playing for a few years, so the CD had gotten a lot of use out of it over that time. Pretty much on a daily basis, especially in the off-season. I’m guessing that the inner circle of the CD had a small crack in it from using it so much, and because of the high speed at which CDs spin, that crack traveled all the way to the outside of the CD making it vibrate all over the place, and finally, explode. Luckily, the drive was still under Newegg’s 30-day product warranty. I was concerned about the lens being damaged because of the tiny shards, so I emailed the RMA department asking if this sort of thing was covered under the warranty. If it wasn’t, I was simply going to open it up (thus voiding the warranty) and dump the pieces out. Apparently it was covered because as their answer, I received an RMA form in my email inbox a day later. For some reason they interpreted my email as a return request, rather than a repair. I emailed them back asking that the “return” be changed to a “repair”. Less than a day later I had a new RMA form in my inbox. So, I packed the burner in its original Newegg packing box, stuck the RMA label on that I had printed out, and took it down to the post office. I was impressed with how quickly the USPS delivered this package to California. For about $8 through regular post, it practically flew from coast to coast in a mere two days. Newegg’s RMA department sent an email notifying that it had arrived. A day after that, a replacement was sent back via FedEx and I installed it as soon as it arrived a couple days later. I’d say that the whole operation moved rather smoothly. This was impressive considering that this was the first time I had needed to use Newegg’s RMA service, and that I was used to waiting a couple weeks for a resolution on an RMA that was sent directly to the part manufacturer. Yep, in terms of service, Newegg certainly is a good egg. As for my client, he was simply happy to have a working CD drive once again.